Note mycelial webbing on this poor petunia plant that had stem rot and dieback. Cause Sclerotinia sclerotiorum, a fungus that produces hard, black sclerotia, which can survive many years in soil. Sclerotia germinate to form hyphae that may attack plant stems and roots or produce apothecia that contain sexual dispersal spores in the spring. Spores may come in from nearby vegetable fields with the same disease. The disease develops in cool, wet conditions and is more prevalent when plants form a complete, compact canopy that holds high relative humidity. 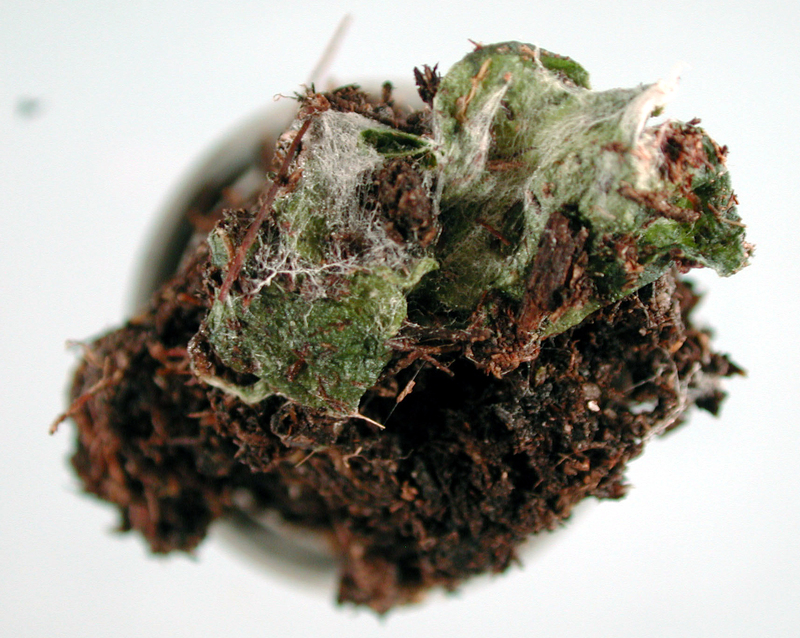 The fungus can colonize dead organic plant matter and survive many years. Wave series cultivars have a prostrate growth habit that is conducive to disease development. In the potato system, flowers are very susceptible to infection and are the main source of stem infection. Infected petals fall onto stems allowing the fungus to gain entry into the stems. Direct penetration of stems, in contact with the soil, from germinating soilborne sclerotia also occurs. Symptoms Off-color, water-soaked lesions develop near the plant's base. Stems become tan with age, look bleached and may be hollow. Later a white, cottony growth develops on the stem. Because of this growth the disease is often called white mold. Hard, black sclerotia may develop with the white growth or in hollow tan stems. Lower leaves tend to die first. Leaf tissue may appear to 'melt out.' The plant's upper portion wilts and eventually dies. A flower blight may also occur. Use a soilless medium or pasteurized soil to start seedlings. Keep soilless media pH on the acidic side, ideally from 5.5 to 6.0. Note that petunias tend to naturally increase the growing media pH. Space plants for good air circulation. Avoid overhead irrigation or any practice that keeps plants wet for extended periods of time. Remove and destroy infected plants as soon as they are found. Clean up and remove crop remains promptly at the end of the growing season. Rotate with less susceptible crops such as alyssum, daffodil, salvia, pansy, or ornamental grasses. Resistant crops include rushes, sedges, and the fountain grass Pennisetum glaucum. Chemical control for seedlings. Some fungicides applied to flowers have worked well in vegetable systems where the epidemiology is better understood. The following materials may provide protection; however, few ornamental trials have been done to demonstrate the best timing. Daconil Weather Stik at 1.4 pints/100 gal water. Blooms may be discolored. Group M5 fungicide. 12-hr reentry. Decree 50 WDG at 0.75 to 1.5 lb/100 gal water. Do not apply more than twice sequentially. Group 17 fungicide. 12-hr reentry. Exotherm Termil at 1 can/1500 sq ft of greenhouse. It ignites to form a vapor that condenses back on the plants. Do not use during bloom. See label for details. Group M5 fungicide. 24-hr reentry with no ventilation or 12-hr reentry with ventilation. Heritage at 1 to 4 oz/100 gal water plus a non-silicone-based wetter sticker. Group 11 fungicide. 4-hr reentry. Pageant at 12 to 18 oz/100 gal water. May discolor blooms that are open. Group 7 + 11 fungicide. 12-hr reentry. Thiophanate-methyl-based products. Tank-mix with another product. Group 1 fungicide. 12-hr reentry. OHP 6672 4.5 F at 10.75 to 20 fl oz/100 gal water. Although not specifically registered for petunia, iprodione (Chipco 26019) is legal to use on this crop. According to IR-4 data it is safe to use. Other trials in California indicate that there may be some problems using these products. References Whipker, B.E., Cloyd, R. and Warfield, C. 2012. Troubleshooting Petunia Disorders. Second Edition. pp 68. Holcomb, G.E. 2001. First Report of Occurrence of Sclerotinia Blight on Petunia in Louisiana. Plant Disease, 85:95.